Transylvania rocks – at least it will for four days in August when its main city, Cluj-Napoca, welcomes 300,000 party animals to the third Untold Festival of electronic music. For the rest of the year, Romania's biggest region plays host to a more sedate yet no less enthusiastic influx of tourists who quickly discover that it's not all vampires. The scenery is spectacular, the people are warm and welcoming – and the beer is a mere €1.40 a pint. Put it on your bucket list now. For tour guide Radu Zahanie, memories of life under the cruel dictatorship of Nicolae Ceausescu are triggered by the most innocuous of sights, such as an apple tree in a roadside garden as we approach Bran. Like all of his compatriots who endured the hunger and other hardships of the Communist era, Radu relishes the freedom that post-revolution democracy has brought. However, while the machine gun execution of Ceausescu and his wife, Elena, on Christmas Day 1989 rid Romania of two real life monsters, it’s stuck with a fictional one, and most people don’t like it one little bit. 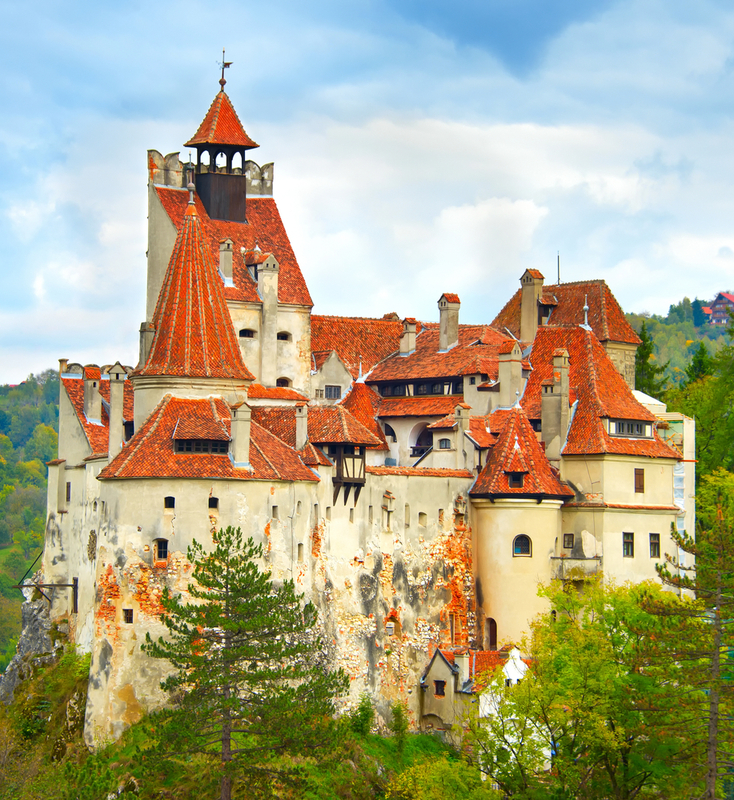 It’s ironic, then, that the 14th century Bran Castle, brilliantly marketed worldwide as Castle Dracula, is Romania’s number one tourist attraction. Even more ironic is the fact that Bran has nothing to do with the blood- sucking count created by Dubliner Bram Stoker, whose 1897 Gothic horror novel has spawned scores of films; nor is Dracula based on 15th century Vlad the Impaler, Prince of Wallachia, who disposed of his enemies by skewering them on sharpened wooden poles. To put it bluntly, Bran, a fortress built on a rock, is a business built on a book. It’s a national monument, but a national embarrassment to millions who resent their go-ahead country being viewed as steeped in silly superstition and primarily identified with a vampire. Nevertheless, the Dracula legend provides a living for thousands of people in an economy where the average monthly take-home salary is 2,100 lei (€465). Despite the detractors, the castle is a spectacular and spooky must-see, though only from a distance as the interior is a bit of a disappointment. Every year, Bran lures 600,000 people through its creaking main door (“They deliberately don’t oil the hinges, for effect,” says Radu) and then lets them down. Professionally translated and edited information boards and literature and some interactive displays would help make the visitor experience a more positive one. Until that happens, the 40 Lei (€8.50) entrance fee would be better spent on six pints of the excellent Ursus lager or a three-course lunch with wine − food and drink in Romania are remarkably cheap. The late Christopher Lee, who played Dracula in six Hammer House of Horror films in the 1960s, said while on location in Romania that it was “the saddest country I have ever visited”. It’s a happier place now, and Bogdan, our ever-smiling tour bus driver, is the epitome of the ebullient spirit we note in encounters with people throughout Transylvania. Earlier in the day, the bus rolled into the ski resort of Sinaia, which in late October was snowless and all but deserted. Half-a-kilometre after what had appeared on approach to be a kitchen showroom but turned out to be full of coffins, Bogdan swung a left and drove up the steep, snaking road to Peles Castle. The Beauty to Bran’s Beast, Peles was built in the German Neo-Renaissance/ Gothic Revival style between 1873 and 1883. This 160-room former summer home of the first king of modern Romania, Carol I, and his queen, Elisabeth, appears to have been crafted by a master chocolatier using Milky Bars for the main exterior structure, Dairy Milk for the timber features and Caramac for the ornamental brickwork. It’s exquisite. Peles, which has been a museum since 1953, was recently inherited by Princess Margareta, the eldest of deposed King Michael I’s five daughters and an old girlfriend of former British prime minister Gordon Brown − they were an item during their five years as students at Edinburgh University. Michael, who was born in Peles in October 1921, died last December at the age of 96 in Switzerland. On December 30, 1947, he was forced to abdicate by the Communists. With a pistol pointed at his head and the threat that 1,000 student protesters under arrest in Bucharest would be shot if he didn’t step down, he signed on the dotted line. Later that day, the monarchy was abolished. The late king was a great great grandson of Britain’s Queen Victoria and a fourth cousin of Charles, Prince of Wales. Charles’ connection with Romania comes as a big surprise: the heir to the British throne is a great grandson 16 times removed of Vlad and besotted with Transylvania. However, Radu is saving that story for later the next day, which begins with a pleasant dander around the medieval city of Brasov. Anyone arriving blindfolded in Brasov would know exactly where they were as soon as sight was restored − look to the top of the 960-metre Mount Tampa and there’s the city’s name in giant white letters that are illuminated at night. 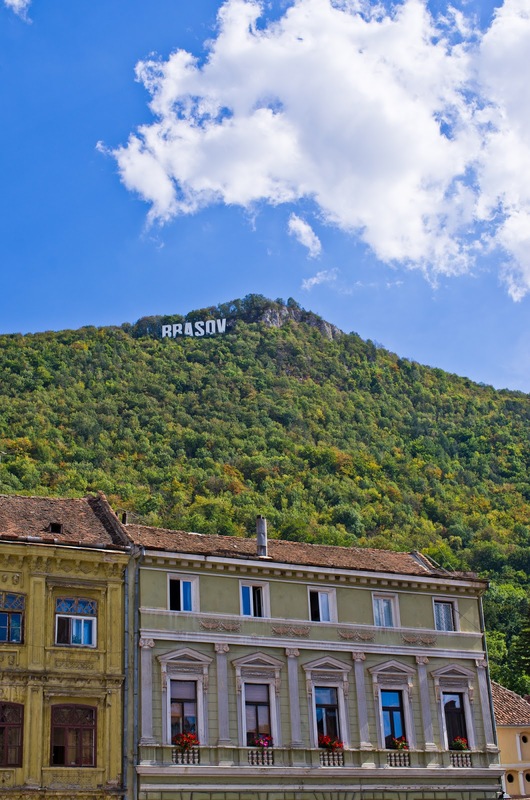 In October 1950, Brasov was renamed Orasul Stalin (Stalin City) and remained so until 1960, when it was changed back. There was no Hollywood-type sign in those days, but local people swear that huge swathes of the forested mountainside were cleared so that the treeless spaces spelled STALIN. Only one photo exists of the comrades’ tribute to ‘Uncle Joe’. It could be genuine, but weighing up the flimsy evidence − a grainy old black and white image that looks like it has been doctored − it might be a tale as tall as Mount Tampa. 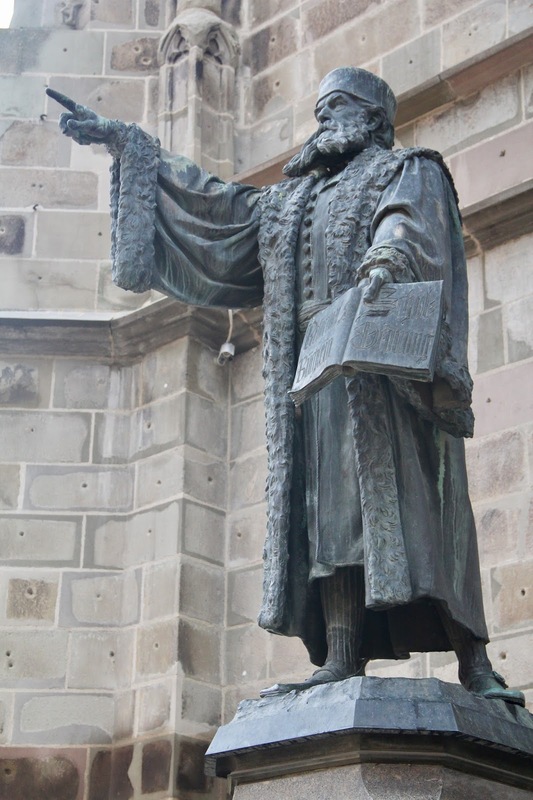 Brasov’s star turn is the originally Roman Catholic but long-time Lutheran Black Church, which was built between 1385 and 1477 and is Transylvania’s biggest Gothic place of worship. Officially the Church of Saint Mary, it got the name by which it’s known from its charred facade following a fire in 1689 that was so ferocious it melted a six-ton bell in the tower. 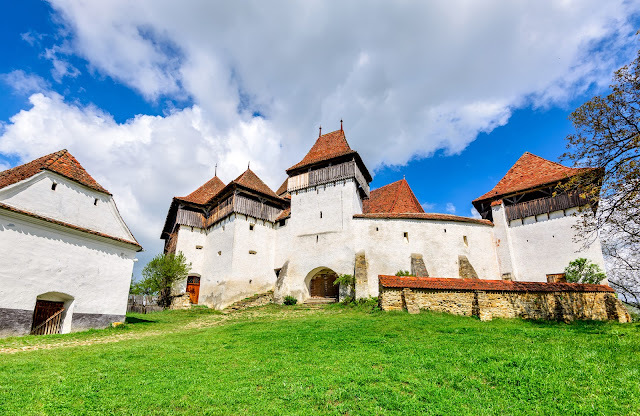 We leave Brasov for Prejmer and a tour of the town’s fortified church, the first of two on today’s travels and one of seven in Transylvania that together are classified as a Unesco World Heritage Site. 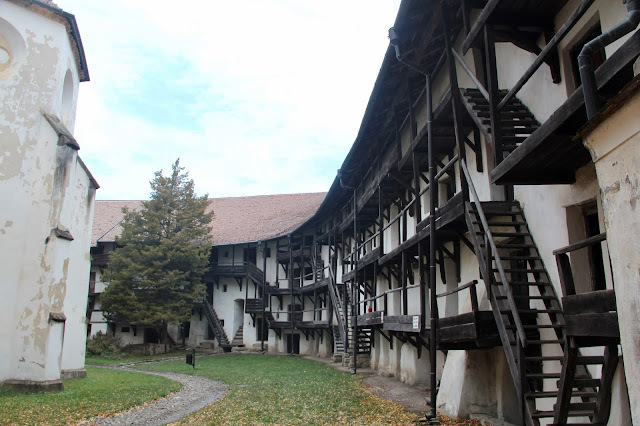 Built by Saxon settlers between the 13th and 16th centuries, these seven, plus scores more throughout the region, offered protection to villagers in times of assault by Wallachian, Mongol and Ottoman raiders. From the street, Prejmer’s whitewashed circular fortifications resemble an Andalucian bullring. Germanic Teutonic Knights began building the church within in 1218, but were expelled seven years later; it was completed in 1240 by Cistercians and is worth a quick peek inside, no more, because it’s the impressive defensive structure that tourists come to see. The walls are five metres thick and 12 metres high and house 270 poky rooms on four storeys. In these cramped spaces, 1,600 villagers would shelter, sometimes for weeks or months and to the point of starvation, when invaders descended on them. The terror, and the increasingly unsanitary conditions that led to the rampant spread of disease as families cowered under the onslaught from without, can only be imagined. It’s with these unsavoury scenes in mind that we reboard the bus and set off for the heritage village of Viscri, where the only invaders these days are tourists. 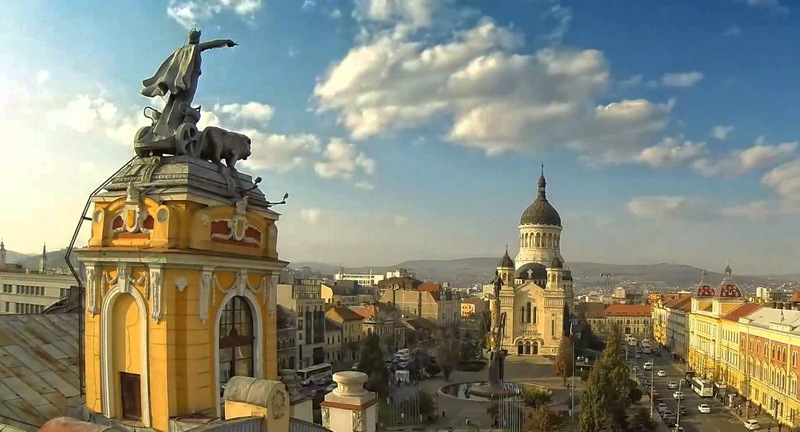 Romania’s membership of the European Union, to which it was admitted in 2007, has brought many much-needed improvements to the country’s transport infrastructure. However, when Bogdan indicates right as the sign for Viscri hoves into view, we’re in for a 7km bone-rattling ride along a cratered gravel track. This is the village that Tarmac forgot and which, says Radu, Prince Charles adores. Two hundred years ago, Viscri was 100 per cent Saxon. Today, it’s home to 430 people − 65pc gypsies (the name they call themselves), 30pc Romanians and 5pc German-speaking Saxons. However, for one week every summer the population increases by half-a-dozen when the royal visitor and his small entourage come to stay. Charles owns a four-bedroomed house for which he paid €15,000 in 1996 and which caters to paying guests. 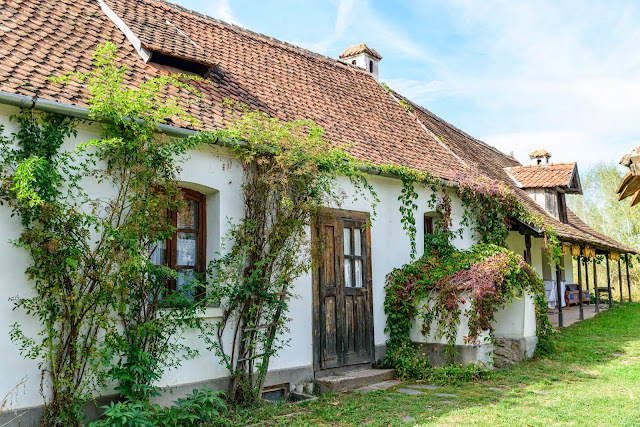 It’s also the headquarters of his Romanian charitable trust, which works to preserve rural architecture through training courses for unemployed people who graduate with restoration skills that often lead to full-time jobs. Walk the streets of Viscri − there are only four − and you’ll soon have a gang of nosy and noisy ducks, geese, chickens and turkeys in tow. A 150-year-old scooped-out tree trunk serves as a water trough for horses, which are the main means of transport and haulage for the gypsy families. In the surrounding fields, it’s horses that pull the ploughs, threshers and other antiquated agricultural machinery. It should all be in black and white. 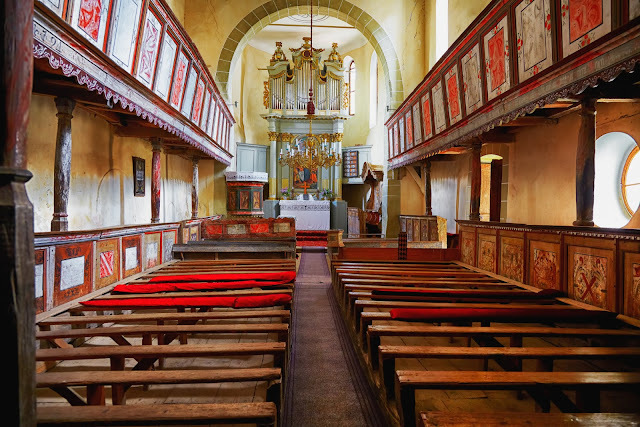 The village’s time warp charm is reason enough to visit, but the fortified church dating from 1230 steals the show, which is hosted by Saxon caretaker, historian and local tourism promoter Gerhild Gross, who immediately apologises for the state of the access road. She’s appeased when we tell her it’s like an airport runway compared with some of the potholed obstacle courses we have to negotiate while driving in rural Ireland. The whole ensemble, including the surrounding defensive walls and towers, is a lot smaller than Prejmer’s yet just as impressive; however, Viscri’s modest church looks and feels lived in, like a much-loved pair of old slippers. In a Daily Telegraph list of the world’s two dozen most beautiful churches, it ranked fifth. 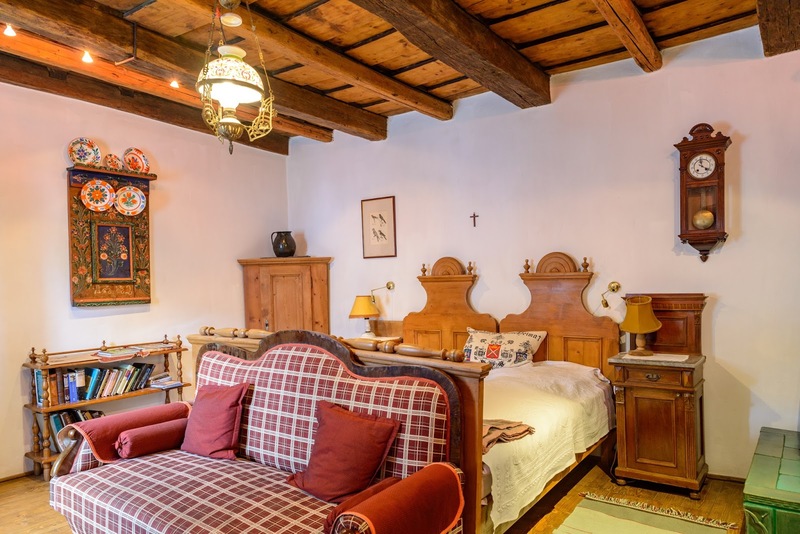 Prince Charles’ old friend and fellow conservationist Count Tibor Kalnoky is also in the bed and breakfast business, and it’s to his cosy, 200-year-old guest cottages in the village of Miclosoara that we proceed after saying auf wiedersehen to Gerhild. The half-dozen former hunting lodges, set around a grassy area with a redundant well in the middle, were heated by log fires and lit by oil lamps and candles until only a couple of decades ago; now they have electricity and en suite bathrooms but, refreshingly, no TVs. The count’s PR executive, Iulia, is the perfect hostess in her boss’s absence and tells us about his admirable heritage and educational projects over a splendid dinner in the main house that starts at 8pm and ends at ridiculous o’clock. It’s a cockerel with a death wish that rouses us from our hardly-slept-in antique beds just after dawn. Breakfast is a subdued affair, and despite the enticing spread of fruits, charcuterie, cheeses and hot-from-the-oven bread, everyone craves coffee. Romanians like theirs black, and the waitress has presumed we do, too. Iulia asks her to fetch some milk, and she returns 15 minutes later, not with a carton from the village shop but with a pail filled to the brim, courtesy of the next-door neighbour’s cow. There’s another wait while she boils it (the milk, not the cow) before delivering a jug to the table. Count Kalnoky’s the main mover and shaker in these parts, and must have been shaking when he inspected his wine cellar after our departure. Luckily, we have a head start as Bogdan bowls along the highway towards the 12th century citadel of Sighisoara, where Vlad the Impaler was born. “Not Dracula − Vlad,” Radu stresses. Like Bran, Sighisoara is full of souvenir shops overflowing with vampire-themed tat. If your mantelpiece is missing a statuette of a bald, dicky-bowed Dracula wearing a black cape and pink, stone-washed denims and about to sink his fangs into a naked young woman’s neck, this is the place to buy it. It’s a couple of minutes before midday, and in the main square all eyes are on the gilded clock face high up on the 14th century gateway tower. Radu explains that every hour, on the hour, animated mechanical figurines emerge from a niche to the left of the clock and put on a bit of a show. “No, please − the information is wrong,” Radu calls as they hurry off. “Vlad could not have been born there. It’s impossible! That house was built in the early 1600s − the original one is gone.” So, too, are the Americans, who spend the next five minutes posing for pointing-at-the-plaque photos. Next door to the house is a restaurant that purports to contain the small, dimly lit room where the newborn Vlad drew his first breath – and many a terrified tourist nearly drew their last. Radu and Bogdan join us for a farewell dinner later that evening in the university city of Cluj-Napoca, from where we’ll fly home the following morning. The early chit-chat is of how our preconceptions of Transylvania – based, to our discredit, on decades-old horror films – have been blown out of the water. 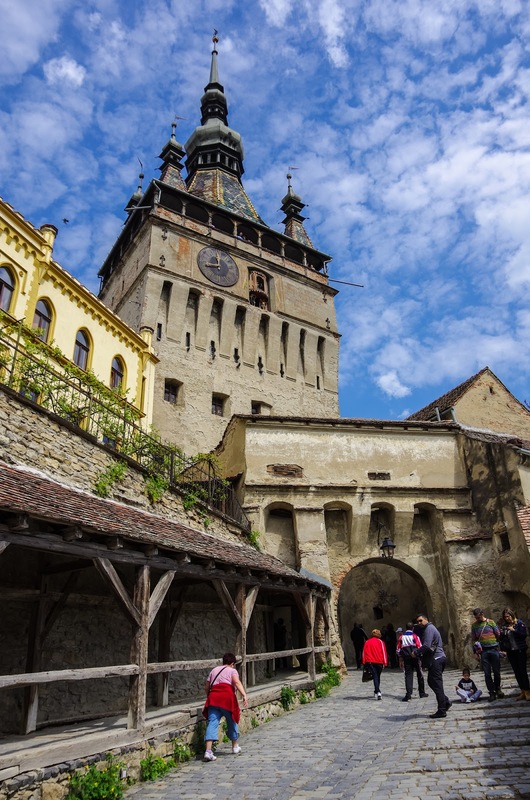 There were occasions when we’d wished Radu would lighten up and stop doing the whole Dracula thing down, but in hindsight he’s right to focus on promoting Transylvania’s rich history, remarkable natural beauty and outstanding architectural heritage. “Transylvania isn’t all Bran,” he says, and we wait for the punchline to his breakfast cereal joke. We’re still waiting. Our guide doesn’t tell jokes, he tells fascinating stories about the country of which he and Bogdan are so rightly proud. At the airport, Radu exhorts us to “take home happy memories of Romania”. We need no urging, but it’s a good thing he doesn’t know that in our hold luggage most of us are also taking home tacky mementoes of you-know-who. I travelled to Romania as a guest of low-fare airline Blue Air (www.blueairweb.com) and the Romanian National Tourist Board (www.romaniatourism.com). For summer 2018, Blue Air flies on Monday, Tuesday, Thursday and Saturday direct from Dublin to Bucharest from €45.49 one way; and on Monday, Wednesday and Friday direct from Dublin to Cluj from €49.74. Our tour of Transylvania was organised by long-established and fully-licensed Romanian operator Eximtur (www.romaniaforall.com). The company offers a wide range of escorted tours and tailor-made packages including transport, hotels and multilingual guides.